Redeemable at over 70 shops, 20 restaurants, 9 spas & salons, CineArts Theaters and Hotel Valencia! 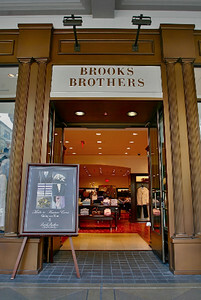 During our remarkable history Brooks Brothers has survived world wars and civil wars, changes in American economics and government, as well as the even more direct threats of constantly evolving fashion trends. Today Brooks Brothers continues to uphold its reputation as an institution based on heritage and value, a commitment to quality, and extraordinary customer relationships.